Now this is a china hutch I could live with! After our wedding I'm going to be overwhelmed with plates, bowls, cups etc and this would be the perfect place to store them. Hmmmm, must get shopping on craigslist to find something like this. 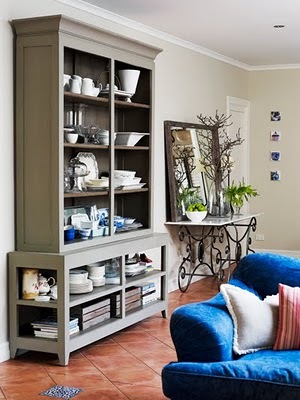 Love that it's open shelving -- imagine the styling possiblities! A wonderful piece!! LOve the look and color!! It almost looks like two pieces. I'm wondering if you get get a couple pieces from Ikea and bolt them together to get a similar look. With a coat of paint it could be amazing. That paint color is absolutely perfect -- a really nice neutral. Good luck in your search! Great piece! Love the color too! Yes you will need something to organize all of your lovely gifts! We got a buffet for our new plates and glasses after we got married and I love it! Happy Thanksgiving! Im in love with the absolutely blue sofa! !